0038 - Lost Lake x Marz Brewing Collaboration — Land And Sea Dept. 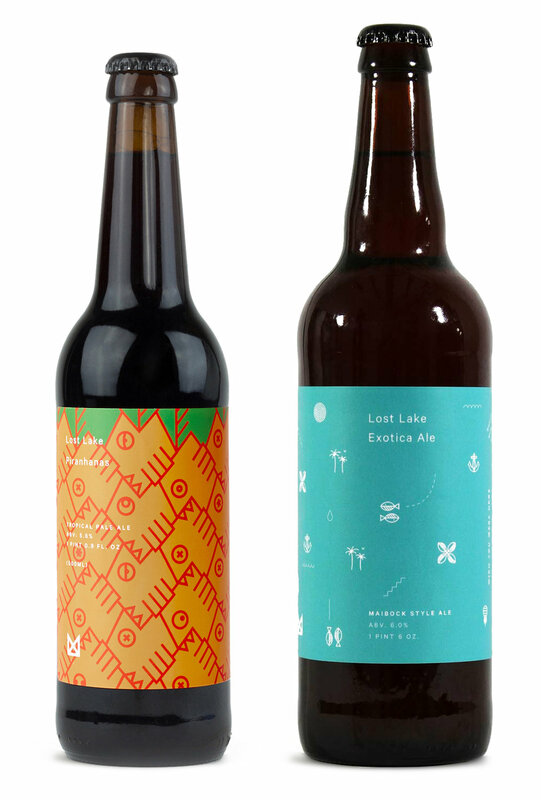 Lost Lake has collaborated with the Chicago-based Marz Community Brewing on not one, not two, but three delicious beers that perfectly complement the bar’s tropical drinks. Exotica is the first collaboration between Marz and Paul McGee of Lost Lake. The malt focused, medium bodied, Maibock style ale is backed with a noble hop spice that complements the flavors and dry finish of rums from various locales. Vacation Beer travels light and makes friends near any coast. The malt character is minimal with a little flaked corn and rice to support the German Pilsner malt and the international blend of hops Pacific Gem hops from New Zealand push through the blend with a subdued bitterness and candy-like berries, citrus and maybe a touch of melon — if you're tasting this beer in a tiki bar. Vacation Beer is a multinational spin on an otherwise true to style American Lager. Piranhanas (piranha + ananas, or 'pineapple') is fermented at high temps with a yeast blend that produces an array of tropical fruit flavors and dries out the beer, emphasizing the fermentation and hop flavors. This beer was born to pair well with any rum, like Vacation Beer and Exotica Ale before it. It's interesting yeast and special fermentation process results in just a little funk and minerality, in addition to some tropical fruitiness. All the collaborations feature transportative label artwork by Drew Ryan and the LSD Art Dept.